This would be cool. When I was a kid, I loved looking through the cracks in the wall to watch the construction on new buildings. 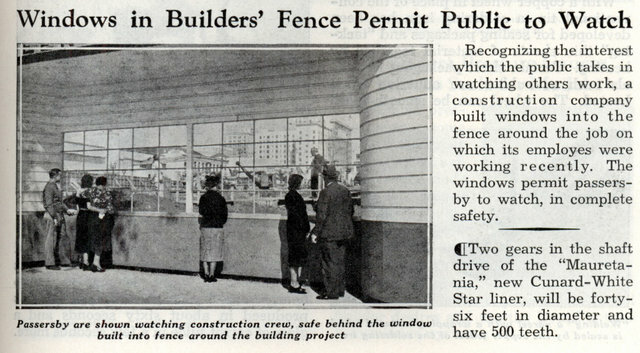 Recognizing the interest which the public takes in watching others work, a construction company built windows into the fence around the job on which its employes were working recently. The windows permit passers-by to watch, in complete safety. Some fences in Boston’s Big Dig project had round holes for the same purpose. I’ve never seen glazed windows, but every construction site I walk by on my way to the supermarket (there are about fourteen) has at least one hole cut out (covered by mesh, as cATFLAP says) so people can look in. Some have one at adult height and one at kid height. I suppose it beats having somebody try to scale the fence (and injuring themselves in the process) to take a look. That looks a lot like a set from the movie “The Fountainhead”. Anyone else notice the two women (or at least the two persons wearing skirts and high heels) standing with their arms wrapped around each other?